Patients love your free portal- it lets them conveniently and securely communicate with you and access their records anytime and anywhere. Our patient portal is fully integrated with EHR saving your staff’s phone time and minimizes distractions as lab results sharing, prescription refill requests, and appointment requests can be handled from within the EHR. Request appointments, prescriptions and refills. Access always up-to-date personal healthcare records (PHR) including medications, lab results, diagnoses, care plans, immunization histories, and more. Quick access to additional healthcare information and educational material related to their diagnosis. Receive automated reminders, alerts, HIPAA compliance notices, and other important announcements. View statements and make payments. Our patient portal facilitates meaningful compliance. 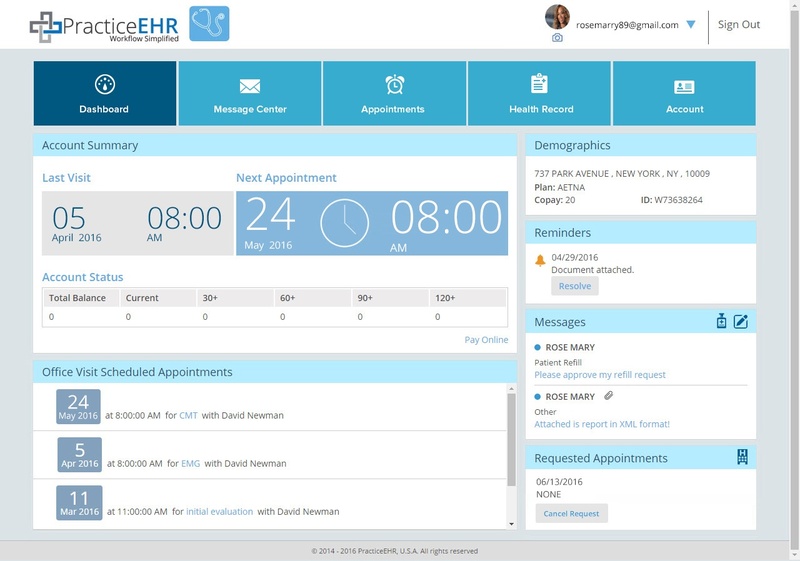 Easy setup- simply enter patient email and enable portal. An invitation email with instructions to your patients is automatically sent out. 100% cloud based- Use your favorite browser or iPad App.